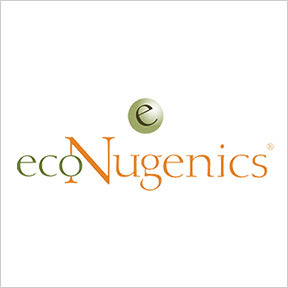 Founded in 1995 by Dr. Isaac Eliaz, MD, MS, LAc, a pioneer in the field of integrative medicine and highly regarded clinical practitioner, formulator and researcher, ecoNugenics® provides targeted high value nutraceutical supplements derived from nature, science and peer reviewed research. Their scientifically researched, physician formulated, clinically tested nutraceuticals are designed for natural, integrative approaches to cellular, immune, metabolic, digestive and cardiovascular health. Formulated with a focus on innovation and modern science, as well as the ancient wisdom of Traditional Chinese, Ayurvedic and Tibetan Medicine, these nature-based heath solutions support health, wellbeing and vitality. Their quality assurance program includes testing of all raw materials and finished products for purity, efficacy and contaminants. Batch to batch consistency is guaranteed through rigorous procedures that meet or exceed the current good manufacturing (cGMP) guidelines as outlined by the FDA. ecoNugenics® utilizes the most bioactive highly absorbable form of every ingredient, and selects botanicals based on organic growing practices and sustainable harvesting. Their dedication to scientific innovation and commitment to research and wellness results in superior natural supplements of the highest standard. ecoMetabolic™: This advanced, integrative formula is designed to deliver broad-spectrum support and protection for comprehensive metabolic health. Select ingredients include botanical blends that help maintain glucose balance, reduce sugar cravings and promote healthy cholesterol levels. Gluten and allergen free, Non-GMO vegan formulation. Integrative Digestive Formula®: Formulated to balance the digestive process and support digestive health, this integrative nutraceutical combines traditional and modern alternative medicines to improve occasional digestive discomfort and promote long-term digestive function and efficiency. Ingredients include key botanicals, minerals, medicinal mushrooms and enzymes. Gluten and allergen free, vegan formulation. Women’s Longevity Rhythms Gold®: This comprehensive blend of botanicals and nutrients is designed to work synergistically to provide maximum nutritional support and promote daily wellness for pre-and postmenopausal women. Gluten free, vegan formulation. Men’s Longevity Essentials Plus®: In addition to essential vitamins and minerals, this formula provides antioxidants and botanicals for maximum daily benefit for key areas of men’s wellness, including liver, prostate, endocrine and metabolic health. Gluten free, vegan formulation. Ten Mushroom Formula®: This product supplies optimal ratios of extensively researched beneficial mushrooms in support of long term immune and overall health. Ingredients include Reishi, Cordyceps, Maitake, Turkey Tail, Lion’s Mane and more. Gluten and allergen free, vegan formulation. This entry was posted in Home and tagged ecoMetabolic, EcoNugenics, EcoNugenics® – Featured Brand, Integrative Digestive Formula, Men’s Longevity Essentials Plus, Professional Supplement Center, Ten Mushroom Formula, Vitamins and supplements, Women’s Longevity Rhythms Gold, www.professionalsupplementcenter.com. Bookmark the permalink.